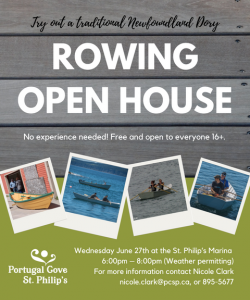 Everyone is welcome to the Town of Portugal Cove-St. Philip’s Rowing Open House today, Wednesday June 27th from 6:00-8:00pm at the St. Philip’s Marina. Click here to check out the article on VOCM News about this exciting event. No experience needed – everyone 16+ can try rowing the dories! For the full schedule of Regatta Festival 2018 events, click here!